I open the kitchen door, and Freya rushes into the house. Once she’s done with her pre-dawn barking, she’s ready to come in. Now. Anticipating our walk, Heathcliff vacates the favored nest-bed in front of the wood furnace. Freya claims the warmth of both and settles in smug comfort. Her job protecting the property is done for the time being. Heathcliff prances and snorts while I lace my trail shoes and tuck my cell phone into the pocket of my warm-up pants. Rain and snow-melting temperatures have dropped to bone-chilling cold and ice. I bundle in thermal clothing, winter wind-breaker, mittens, and warm cap. As Heathcliff and I walk down the terrace path to the top of the driveway, I hear the roar of a waterfall through the fleece of my cap. 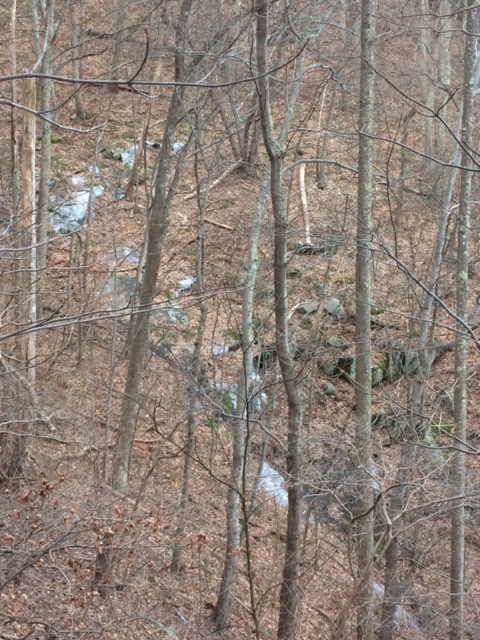 We climb the path to the overlook and capture this scene of ice and water coursing down the ravine in front of us. Down the driveway to the turn-around at the bottom of the ravine, we photograph the larger view of mostly solid becoming mostly liquid­. Solid ice melting into liquid tears, like writing hard stories. All of us have “hard stories” to tell, some harder than others, as noted in Writing Hard Stories, by Melanie Brooks. Stories of abuse at the hands of others or ourselves. Stories of loss—parent, spouse, child, sibling, marriage. Stories of illness. Some of us are called to write our stories; more of us enjoy reading these stories. Of the eighteen writers interviewed, I had read books by Joan Wickersham, Abigail Thomas—keynote speaker at Hippocamp 2018—and Edwidge Danticat, a keynote at the 2018 Festival of Faith and Writing. All the authors spoke to Brooks about the necessity and difficulty of closing the emotional distance when writing memoir and, at the same time, maintaining the distance one needs to craft the story for others to read. All were surprised when readers connected the stories with their own. Readers greatly appreciate the beauty that comes from the authors who “melt ice,” wrestling and writing in solitude. “The worst story that we can tell ourselves is that we are alone,” Brooks wrote in the afterword. How well she knows, since she’s writing her own hard story of loss. Heathcliff and I follow the mountain road, which parallels the stream into which the waters of the ravine flow. I think about how stories connect to other stories like streams into rivers and lakes and oceans, making one great, mysterious story. The best story that we can tell ourselves and others is that we are not alone, I say to myself. 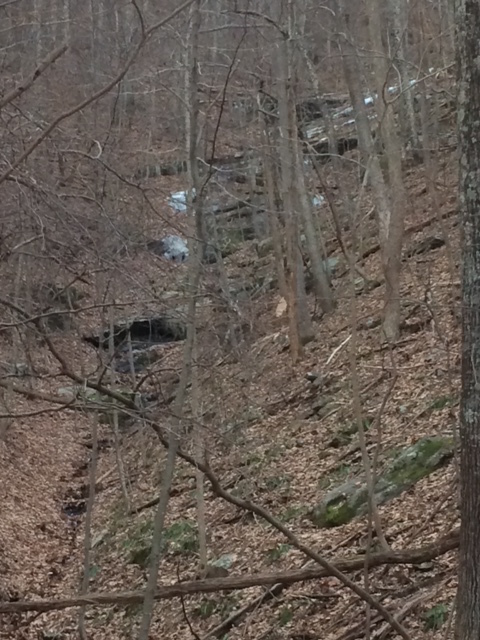 There is always hope, even when life is a steep ravine of cold slippery ice. At home, I open the kitchen door, knowing exactly what Heathcliff and Freya hope for. Love, shelter, warmth. And breakfast. Now. One fundamental element of my love for HippoCamp is discovering others who share our dreams of triumphant and moments of crippling self-doubt. That more than any part inspires us to keep going. I’m writing a hard story too. More than anything, I take solace in meeting others doing the same. It keeps me going too. Wonderful post. Thank you, Emmy. I highly recommend Melanie Brooks’s book and wish you well on your journey. -C.D.